Black pepper is one of the most common spices used around the world. It not only adds flavor to a variety of foods but it also aids in digestion due to the active compound piperine (Le Blanc). Black pepper is also known as black pepper oil, Brazilian black pepper, pink pepper, red pepper and white pepper. One of the most heavily researched benefits of black pepper is its ability to increase the production of gastric juices. In a study conducted by the University of Port Harcourt, it was found that piperine increased the levels of gastric juiced by 22% (Le Blanc). Thus, eating black pepper with a meal can increase the body’s ability to break down and digest food. Recent research has also shown that black pepper increases the absorption of nutrients and plant chemicals. In a study found in the Critical Reviews of Food Science and Nutrition stated that black pepper increased the absorption of nutrients and drugs though the intestinal tract (Le Blanc). This occurs because black pepper changes the permeability of the intestinal wall while slowing down gut motility which allows time for more absorption to take place. Black pepper is very beneficial for cardiovascular health. Black pepper contains the mineral chromium which helps the body metabolize fats and carbohydrates. The University of Maryland found that higher chromium levels lead to lower triglycerides levels as well as blood sugar levels which decreases the risk of not only cardiovascular disease but diabetes as well (Allane). There are very few and rare side effects of consuming too much black pepper. Pepper has a burning aftertaste which can agitate the mouth. 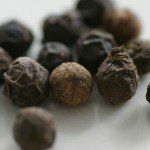 When consuming a large amount of black pepper , one has to be careful that it does not accidently get into the lungs as this can cause death (Black and White Pepper). Black pepper may also cause redness and burning if it comes into contact with the eyes. Allane, Fossette. “Black Pepper and the Heart.” Livestrong, 08/11/11. Web. 22 Jun 2012. “Black and White Pepper.” WebMd, 2009. Web. 22 Jun 2012. Le Blanc, Joel. “Pepper and Digestion.” Livestrong, 02/08/11. Web. 22 Jun 2012.